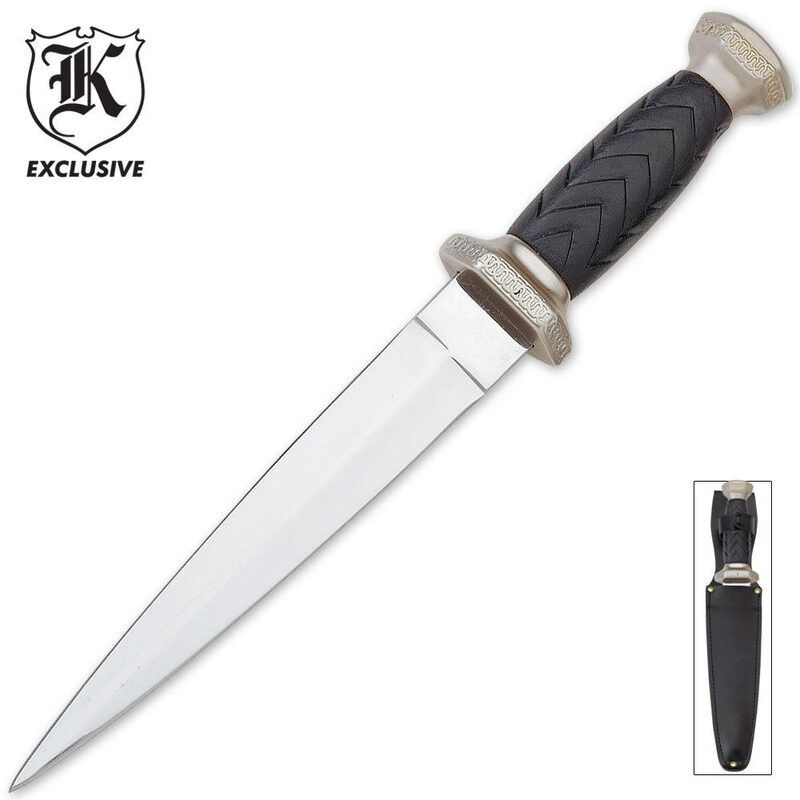 A classic reproduction of the Scottish period piece, the Sgian Dubh or "black dagger" is guaranteed to add traditional elegance to your collection. Featuring a 5 3/4 in. stainless steel blade and black leather wrapped handles. Includes sheath. 9 1/8 in. overall. Okay, It's a Dagger. I haven't tried to shave with it. I haven't baton-ed it. I haven't thrown it at logs or trees. Because it's a Dagger ( see "Shiv" in the dictionary. Same thing - nicer handle. Made for poking, not slicing or throwing). And I like it. Sturdy, tight, the blade is slightly flexible ( helps around those pesky ribs). Wicked sharp point and the edge comes sharp enough for it's intended purpose, but you can get it sharper if you'd like. Under $15? Pleased as I always am with BudK P.S. - Anyone that can legally own one needs to buy a Timber Rattler Western Outlaw Bowie. Just because. Look it up on YouTube. See it get abused. Another Tough Knife Awesome Deal is a Military Rescue Tanto. I now own 7 of those. ( and thanks to everyone at BudK!!! Long Time, Many repeat purchases customer giving a shout out here!). This a good, solid knife. It isn't super sharp straight out of the box, but it has a good point and is suprisingly heavy. Definitely worth the 8 bucks. The workmanship and authenticity of this dagger is beyond belief !! Everyone that has looked at this knife said WOW! Its absolutely gorgeous. The this dagger is perfect in every way. I have purchased several and I am almost sold out! Buy one, and you will see what the rave is all about. As stated, a pretty dagger, but unless it was a replica of those used by a small Scottish person or child, it's only a letter opener. Still a nice piece. I got two at a BOGO sale, so now I can open letters twice as fast. I use my weapons for stage, so I can't comment on the sharpness- I dull them as soon as I get them. I like these daggers for their basic design and cheap price. Great for costume and light stage-combat duty. I had one fall apart earlier this year, but a bit of glue and its good as new. The newer sheath looks much sturdier than the old one- we'll see if I need to build a new one from scratch. This dagger is awesome it is meant to be used as a letter opener or a display but the dagger itself is sturdy and the tip on the blade is fantastic.It does have its cons like when you first get it you need to air it out because of the bad smell and the pommel will come off after extended use which shouldn't happen all in all great product THANKS BUDK. I am a new collector to daggers so when i saw this dagger for cheap i decided to start with it. I got what i payed for, a cheap replica. Its low price comes from the cheap leather and it not being sharp. though for a start to a collection it is just fine. Cheap dagger, cheap price. Its solid but its edge geometry and material makes it dull and unlikely to be sharpened well. Cheap sheath. Very reminescent of a letter opener. Excellent dagger worth way more than 8 bucks. The blade is sturdy and the balance is great. Delivery speed was superb. the handle was smaller than I expected but that's not a big issue. money well spent, would buy again.